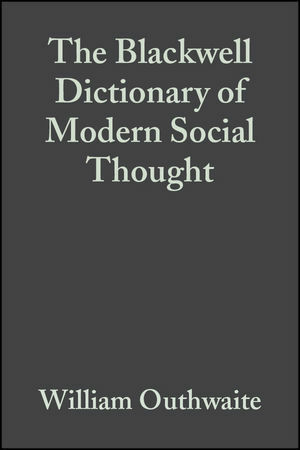 Modern social thought ranges widely from the social sciences to philosophy, political theories and doctrines, cultural ideas and movements, and the influence of the natural sciences. Provides an authoritative overview of the main themes of social thought. Long essays and entries give full coverage to each topic. Covers major currents of thought, philosophical and cultural trends, and the individual social sciences from anthropology to welfare economics. New edition updates about 200 entries and includes new entries, suggestions for further reading, and a bibliography of all sources cited within the text. William Outhwaite is Professor of Sociology at the University of Sussex. He is the author of Understanding Social Life: The Method Called Verstehen (second edition, 1986), Concept Formation in Social Science (1983), New Philosophies of Social Science: Realism, Hermeneutics and Critical Theory (1987), and Habermas: A Critical Introduction (1994). He edited The Habermas Reader (1996), The Blackwell Dictionary of Twentieth-Century Social Thought (with Tom Bottomore, 1993) and The Sociology of Politics (with Luke Martell, 1998). Provides an authoritative and comprehensive overview of the main themes of social thought.